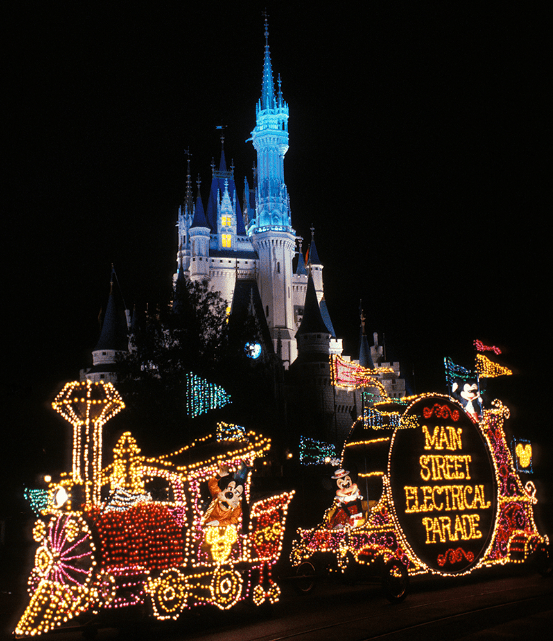 9) Main Street Electrical Parade at Magic Kingdom, 1977 – 1991, 1999 – 2001, 2010 – 2016 Magic Kingdom’s nighttime spectacular was a hit with Guests along Main Street U.S.A. for a combined total of over 22 years. The Main Street Electrical Parade took place each night at Magic Kingdom (weather permitting), and the amazing production featured over 80 live performers. Sounds like your typical parade, right? Maybe—except for the fact that each of those live performers was covered in thousands of electronically-controlled lights that were synchronized to music—a song called “Baroque Hoedown” that many of us can still hear in our fondest Disney World memories. This was no everyday parade; rather, it was a technological marvel that used over 11,000 LED lights on the dancers alone! The excitement built with the vocoder’s introduction that welcomed everyone, young and old, to the “spectacular festival pageant of nighttime magic and imagination in thousands of sparkling lights and electro-synthe-magnetic musical sounds—the Main Street Electrical Parade!” Almost every character from Disney’s classic films had a part in the parade—everyone from Alice, the White Rabbit and the Caterpillar from Alice in Wonderland to Mickey and Minnie, to Snow White, the Seven Dwarfs, Cinderella, Peter Pan and Pinocchio. Sadly, the lights from the Main Street Electrical Parade went out forever on October 9, 2016.